Our Aero garden chairs are contemporary, stylish and comfortable. Featuring flared armrests and a slatted backrest and sides, they will work well as a standalone garden chair or to complement one of our outdoor dining tables to complete a set. 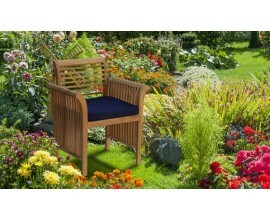 Our robust Aero garden chairs look striking with their slatted design. Crafted from durable, sustainable grade-A teak, they can be left outside all year round and require virtually no maintenance. 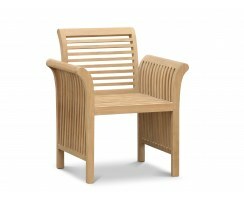 As comfy as they are stylish, our Aero outdoor chairs will suit your space and impress your guests for years to come.